According to Jeff Zrebiec of the Baltimore Sun, Baltimore Ravens second-year cornerback Maurice Canady is the favorite for the slot cornerback role that’s been vacated by the injured Tavon Young. It’s not surprising that Canady has impressed the Ravens coaching staff during minicamp. In his 2015 college season at Virginia, he excelled in the slot, allowing just 0.61 yards per cover snap, the second-lowest among 24 draft-eligible corners with at least 170 coverage snaps. When targeted in the slot, he allowed a passer rating of just 73.8, which ranked sixth. 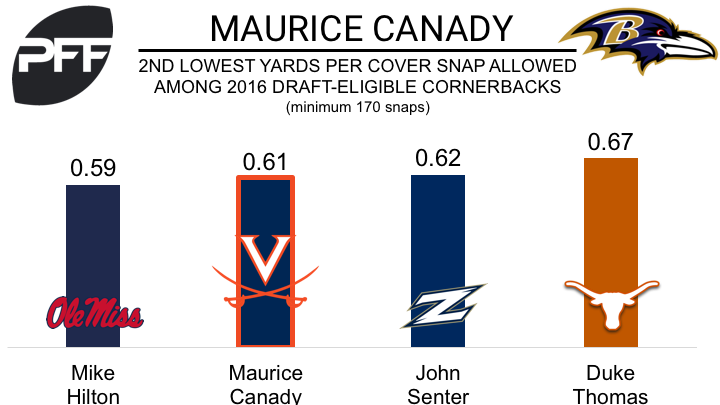 Canady was selected by the Ravens in the sixth round of the 2016 NFL Draft, but failed to see the field on defense in his rookie season. He accumulated two tackles on special teams before a hamstring injury sent him to IR for the remainder of the season.